We glad to announce that new function is available in Bopup Communication Server version 3.3.9. Now you can easily search and display messages and file transfers from the archive by a range of different criterias. 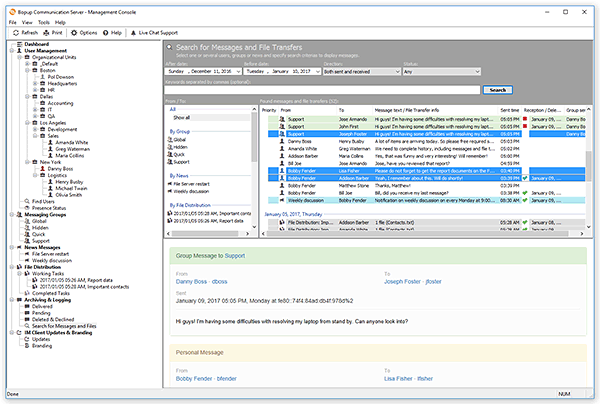 We implemented the search feature as a built-in pane in the Archiving & Logging view in the Management Console. It shows a list of objects on the server that are grouped by their type, i.e. by Group, by News Message, by Distribution tasks and by User. So it is simple to find and select a user account or group for which you wish to find messages. Of course, you can select multiple items from the From / To list by holding Ctrl key. Advanced information is also available in the online help section at Archiving & Logging. Search for Messages and File Transfers.